Samsung UE65JS9000 review | What Hi-Fi? Samsung had a very good 2015. Its TV range earned a swathe of glowing reviews, including five that went on to win What Hi-Fi? Awards. Yes, it’s 2016, which means a new range is due in months. But that doesn’t mean you ought to discount last year’s stock, especially when they have been discounted at several high street retailers. The £2800 price tag is a significant step down from the launch price of £3700, and a good deal considering the Samsung UE65JS9000 is very nearly at the top of the hierarchy. It sits only one step down from the Samsung UE65JS9500, which offers slightly more advanced processing. Not that you’ll be left wanting once you clap eyes on the JS9000, which is ranked highly enough to qualify for SUHD status – Samsung’s way of differentiating its very best from ‘regular’ TVs that offer 3840 x 2160 Ultra High Definition (commonly known as 4K). What does the S stand for? Nobody knows. ‘Super’ would make sense but it could easily be ‘Sith’ or ‘Smarties’. Either way it refers to the use of fancy processing and nano-crystal technology, where a thin layer of the stuff in the display panel emits light in various colours according to their size. SUHD TVs claim to thoroughly embarrass conventional UHD TVs: 64 times the colour expression, 2.5 times the brightness and 10 times darker blacks. ‘Sith’ seems ever more appropriate. Do those claims hold up? While we’re not entirely sure about those numbers, we can verify that the Samsung UE65JS9000 offers a picture of extraordinary beauty. We begin with UHD footage, because there’s a lot more of it about these days, thanks to the likes of Netflix and Amazon. The Samsung makes the most of those 8.3 million pixels. The entire point of Ultra High Definition is clarity and sharpness, and here you get that in spades. It’s easy to make out the varied texture of Parmesan cheese on Chef’s Table. There’s virtually no picture noise either. As for colours, those nano-crystals give you lush, expressive hues. It’s a wide colour palette – and doesn’t look exaggerated or false. Skin and grass tones are spot on. Contrast performance is strong, with no problems juggling bright whites and deep blacks. Those black levels are surprisingly deep for an edge-lit LED panel, with a good amount of detail in shadows, but we note this TV doesn’t go quite as black as the top-of-the-line Samsung UE65JS9500. On the whole, Samsung’s local-dimming tech does a very good job. This TV is also compatible with High Dynamic Range (HDR). While there is still a dearth of HDR content, what we found on Amazon Instant Video is impressive. The colour gamut is wider and more life-like, while still resisting the temptation to get psychedelic. 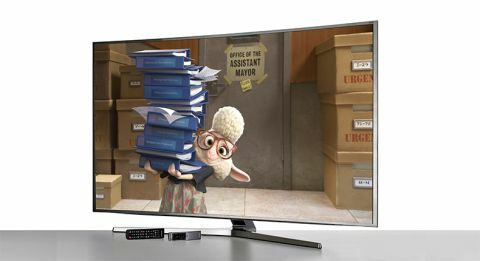 Step down to Blu-ray and the Samsung proves itself an adept upscaler of Full HD 1080p. It is sharp enough that we didn’t feel the need to switch back to UHD. The standard definition you get from DVDs and most TV channels is significantly less clean and defined, as expected. Overall, this is a hugely impressive picture. As for the sound, we are pleasantly surprised. We’ve come to expect flat TVs to sound thin and hard, but that isn’t the case here. There is a 4.2-channel sound system packed in there, four front-firing drivers and a dual subwoofer. It’s not the stuff of a hi-fi system, but the weight, clarity definition and spread of the sound means you don’t need a soundbar straight away at least. The design doesn’t wander far from the rest of the 2015 range. Expect a slim bezel and a minimalist Y-shaped stand, with a single point holding the screen up. Some of the lower models in the range had a wobbling issue, but this one is sturdier and heavier, too. It takes two people to install the thing, especially if you’re planning on wall-mounting. The screen has a curvature of 4200R, which refers to a radius of 4200cm. That means it’s a fairly gentle bend, so you’re not anchored in the central viewing position. But is a curve necessary? No, and it comes down to your preference, so make sure to check it out in a showroom before laying down the cash. As a member of Samsung’s top tier, the UE65JS9000 is well connected. The highlights are: four HDMI sockets, three USB ports (one of them a 3.0), optical digital output, ethernet, as well as aerial and satellite connections. Samsung maintains the habit of moving all these bits and pieces off site – you won’t find them on the back of the telly. Instead they are on a separate ‘One Connect’ box, which connects to the TV via a single proprietary cable. This saves space on the TV itself, and it also means you could position the connections somewhere more accessible than down the back of the shelf. Samsung sees these One Connect boxes as an external upgrade option, so you won’t need to buy a new TV just to get the latest connections, chipsets, and smart features. Curiously, Samsung doesn’t seem to think much of 3D’s longevity. This set supports active 3D, but no glasses are provided. Samsung’s operating system of choice is called Tizen. It looks remarkably similar to LG’s Web OS. The idea is that you can jump between apps, TV programmes and physical inputs as easily as flicking between channels. No longer are you booted off whatever you’re watching and made to watch a loading screen while the TV brings up a ‘smart’ landing page. You navigate the options on a pop-up menu, like the ones on a Blu-ray disc – all without interrupting your current programming. It’s useful, though navigation isn’t the smoothest. Even with an octa-core processor we experienced the occasional lag and stutter. By contrast, LG’s WebOS is silky smooth. Is the Samsung UE65JS9000 worth it? We think so. It is an excellent TV from the top of a series that has done extremely well. We like the big-screen picture, we like the sound, and we like its smart features. Factor in the discounted price – around £1000 less than at launch – and this becomes a very tempting proposition indeed.